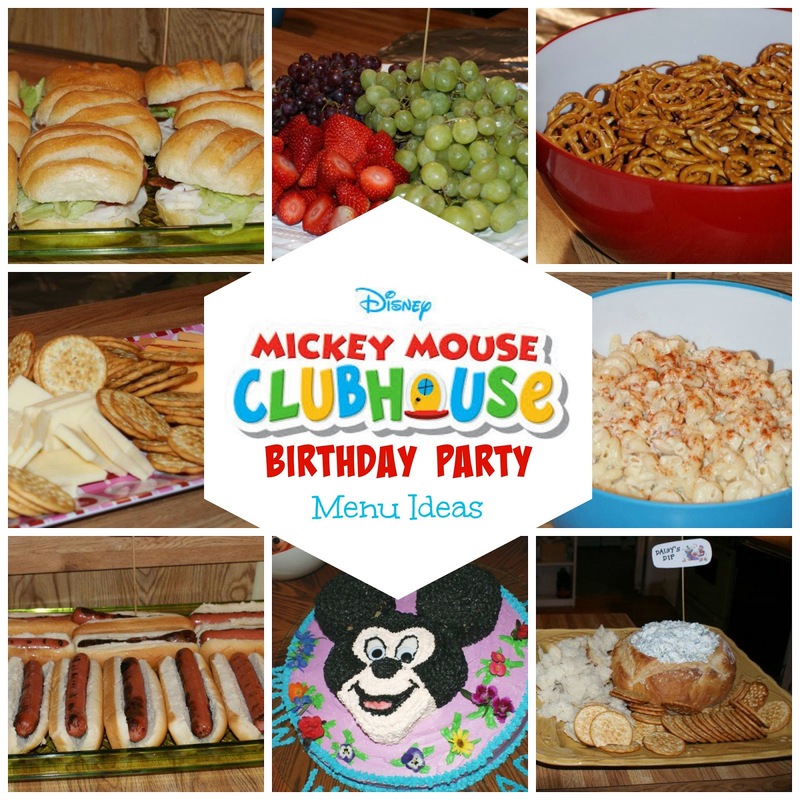 A collection of 8 simple and delicious Mickey Mouse Clubhouse themed menu ideas for you child's next birthday party! Plan ahead to make all of your menu items tie in with his or her favorite characters from the show! Every year for my children's birthday party, I let them decide the theme. The themes always express what they're obsessing over at the time: Mickey Mouse, The Very Hungry Caterpillar, Paw Patrol, Hearts, Mia & Me, Yo Gabba Gabba, On the Go, and Dora the Explorer have been their choices so far. I love planning the party menus to go along with the chosen theme (duh, I <3 food), and my mother-in-law has always had carte blanche when it comes to the cake. Normally I'd have a hard time handing over the reins when it comes to food for parties I host, but she's amazing. And it leaves me time to focus on making everything else extra special! For my little lady's 3rd birthday party, we were all about Mickey Mouse Clubhouse! Here are 8 Mickey Mouse Birthday Party Menu Ideas for your little Mickey lover's next birthday party! 1. 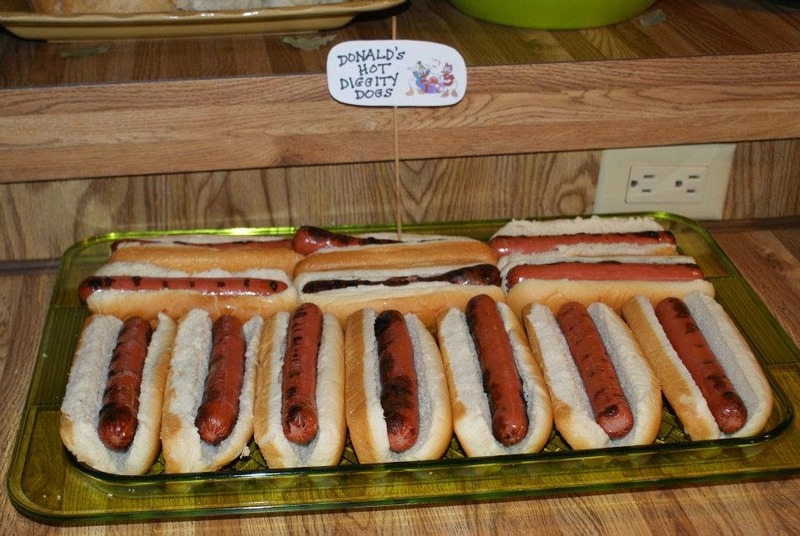 Donald's Hot Diggity Dogs - Easy peasy. Grill some hot dogs (we always go with turkey dogs) and throw them on some buns. Don't forget the fixin's! 2. 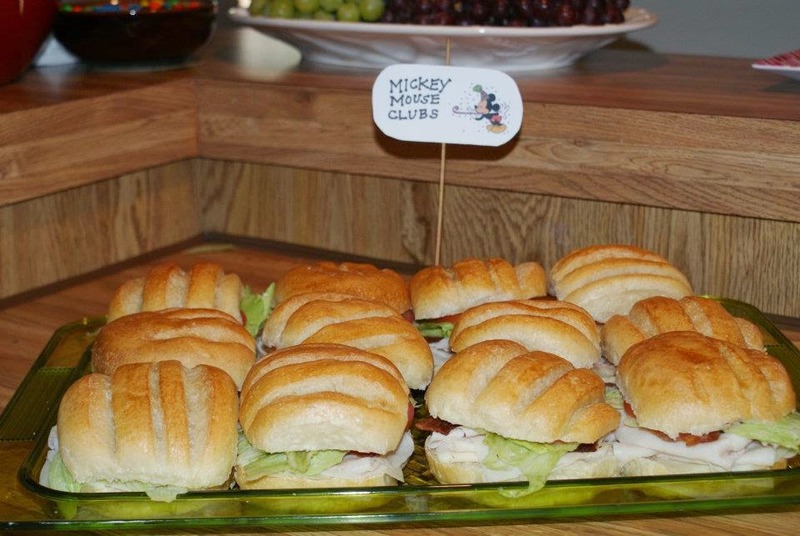 Mickey Mouse Clubs - You could assemble these pre-party, or have a little do-it-yourself sandwich bar. And who doesn't love bacon at a party? Done. 3. 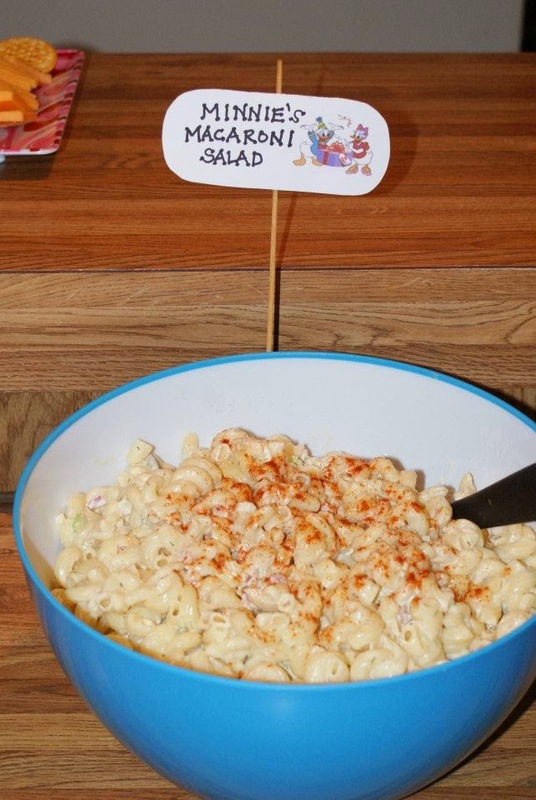 Minnie's Macaroni Salad - The perfect accompaniment to the club sandwiches and hot dogs! The best part is that you can prep macaroni salad the day before. 4. 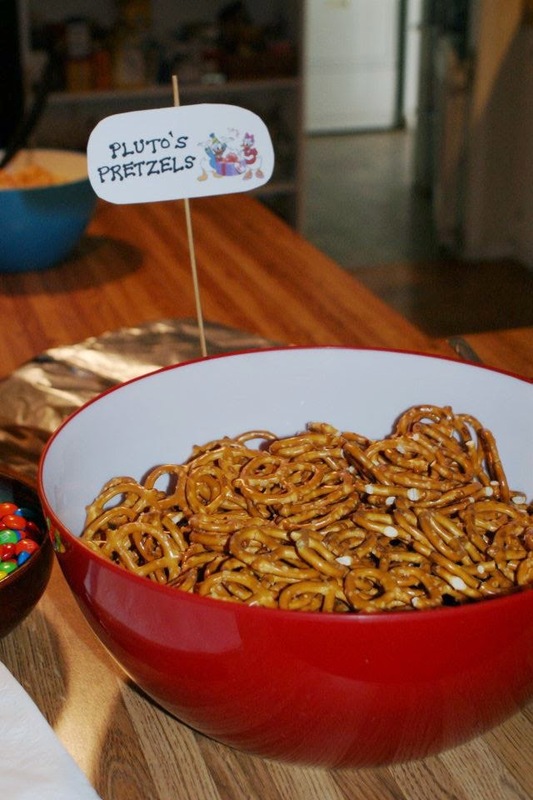 Pluto's Pretzels - Pretzels in a bowl. Kids love them. Adults love them. No prep time. Win! 5. 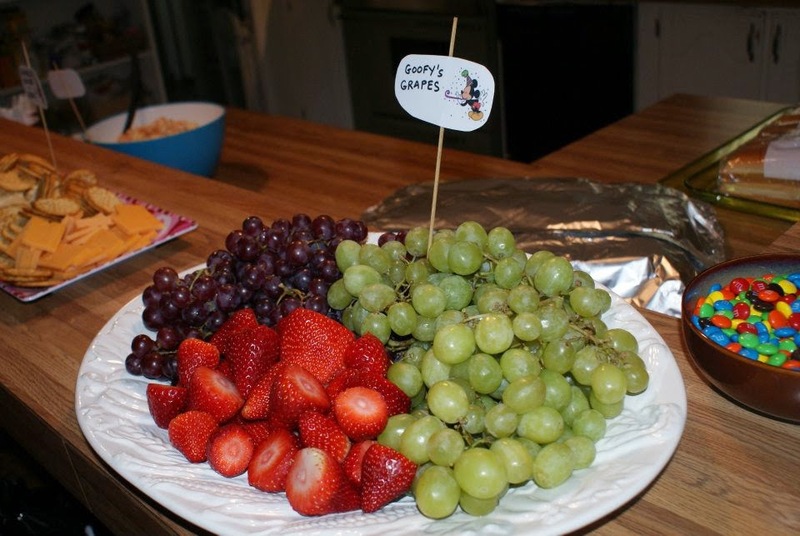 Goofy's Grapes (and other fruits, too!) - While I am def a chip girl, it's always a great idea to serve something a bit healthier than just chips and dips. Hellooooo, fruit. You're welcome at my party anytime! 6. 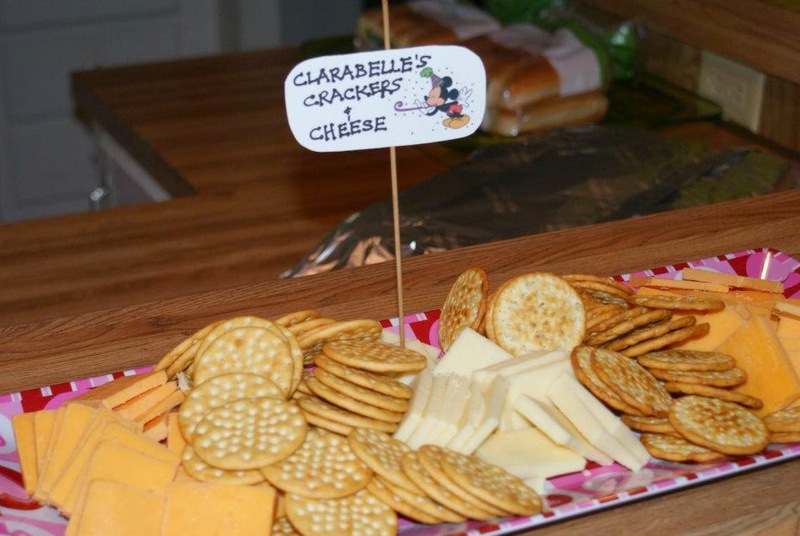 Clarabelle's Crackers & Cheese - Have I mentioned that one of my favorite foods is cheese? You'll be surprised how quickly a some sliced cheese with crackers will disappear at your next shin-dig. For a kid-heavy gathering, I keep it simple and usually go with cheddar. 7 & 8. 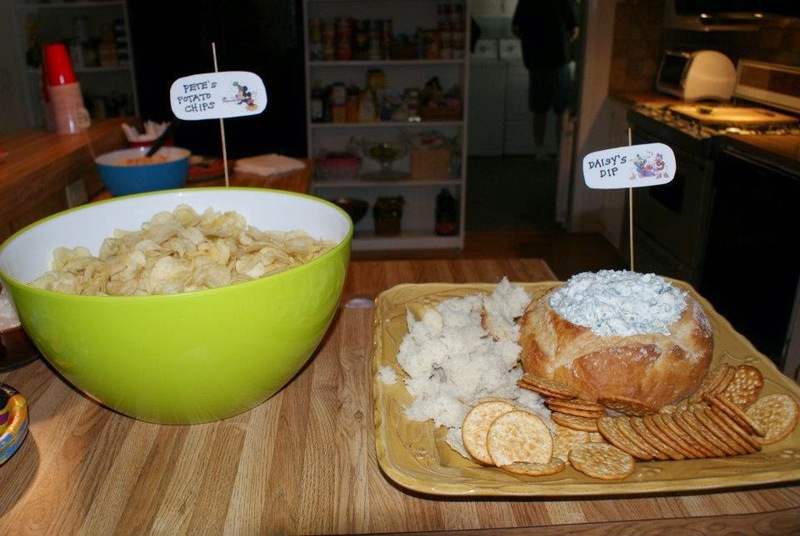 Pete's Potato Chips and Daisy's Dip - A party isn't a party without chips and dip! I decided to go with Ranch Spinach Artichoke Dip and some simple plain potato chips, my daughter's favorite kind. Can't forget the cake! My mother-in-law does a stellar job every year and I am always incredibly thankful and blessed that she puts in so much effort. Thanks, Grandma! Note: I highly suggest using cute little labels for your party food like I did! I found the printable tags here and attached them to some wooden skewers. It makes for such a fun presentation! 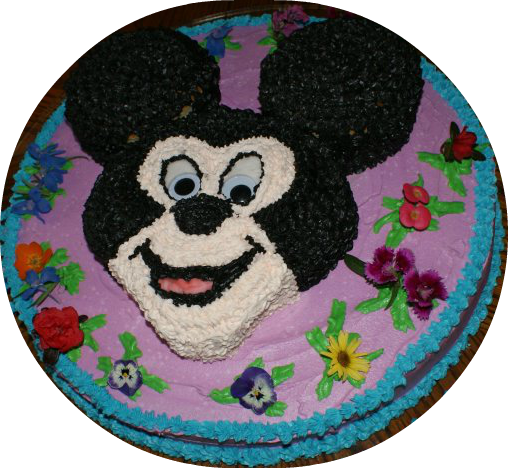 Do you have any other ideas for fun Mickey themed party food? Share your ideas in the comments! This event planner was the perfect fit for me. I had no idea where to start, and she patiently sat down with me going over the painstaking details of table cloth, chairs, plates, silverware and everything in-between by setting them up so that I can see the picture in whole.